I worship the memory of Don Revie. He’s probably my all-time hero; he took over a nothing club with a nothing history, famous only as a stepping-stone for the World’s Greatest Footballer on his way to success with Juventus as Italian football’s finest-ever import (yes, step aside, Platini, Maradona, Law, Greaves et al – John Charles is still the King for the tifosi). Don took over at Elland Road, instituted a scouting system second to none and – let’s cut to the chase here – gave us the finest club side these islands had ever seen. But in one respect, Don’s effectiveness is open to doubt. A notoriously superstitious man, he became convinced that Elland Road was under a malign curse – so he recruited a gypsy from Scarborough (I can personally confirm that the place is crawling with them) in order to exorcise the spell and ensure success. The fact that Revie and his team achieved far, far less than they should have has been put down to various factors over the years, but the possibility that the lady from Scarborough was off-form the day she went about her curse-lifting cannot be excluded. It would, perhaps, be the most likely cause of United’s managing to finish runners-up so often with easily the best team around. Always the bridesmaids, never the brides, it was often and cruelly levelled at the peerless Whites – and while some trophies found their way to LS11, that legendary team – dominant during a viciously competitive decade – never won its proper dues. And when the talent drained away from Leeds in the wake of Don’s departure – well, then the curse really bit. From the perspective of a half-century on, it’s possible to argue the theory that Don failed in his efforts to rid Leeds United and Elland Road of supernatural barriers to success. It’s even arguable that, since those halcyon times, the strength of whatever evil influence pervades LS11 has actually increased. How else to explain the fact that so many players over the years have done well in elevated company, but arrive at Leeds United and are immediately transformed into bumbling failures? Or, indeed, the number of players who have served a spell with the Whites, looked hopelessly out of their depth – and have then gone on to do distinctly OK elsewhere? As a club, we do seem cursed in some vital particulars. Look at the effect we have on centre-halves, for instance. They come in, they look good, they earn a permanent deal – and then they start playing like Frank Spencer in the 1970’s sitcom “Some Mothers Do ‘Ave ‘Em“. Likewise with managers. Our last two were notable for the ease with which they have attained promotion from this league into the FA Barclays Promised Land. But they come to Leeds, shine briefly before the Gypsy’s Curse gets under their skin – and they then start floundering horribly, unable to make a single coherent decision, at a loss to pick a winning team or choose effective tactics. They end up at after match interviews or press conferences, looking like rabbits caught in the headlights. It’s pitiful. Never has this line of reasoning seemed so obvious to me as right now. We’ve just had two home games against distinctly un-scary opposition – and we’ve contrived to lose both, heavily, with only late goals putting a rather flattering patina on the ugly landscape of abject failure. We have an intimidating stadium, players who have been successful elsewhere – and who will doubtless be successful elsewhere in the future – we have the best fans in the world, we’ve had managers with proven track records. And yet we’re still irretrievably, inexplicably crap. What to do? Maybe the Italian guy is the answer in more ways than just the obvious financial sense. He’s quite a superstitious cove himself, is our Massimo. Perhaps he will sense the malevolent ambience around the place and take steps of his own to get rid of any other-worldly nasties that Don’s Scarborough exorcist failed to blitz. Maybe the key to Cellino’s revolution lies in his ability to follow his own superstitions, make whatever supernatural changes are necessary and see Elland Road emerge from under the cloud of an ancient curse and into a bright new future where we get a bit of bloody luck every now and then. At least we can rest assured we won’t be sporting a purple strip, and we can hope against hope that Cellino’s lucky colour is all-white. It’s got to be worth a try. Let’s face it, we’ve tried just about everything else – and still the Gods have rarely smiled upon us. Then again, they’re usually too busy sorting out a spawny late winner for Man U, damn them. We’ll just have to hope it’s not too late to get rid of whatever shreds of curse are still left after Don Revie’s failed attempt to get us blessed back in the sixties. And I still won’t have a word said against the Greatest Manager There Ever Was. He may not have known how to pick an effective gypsy, but he sure as hell could build up a club from nothing. How we could do with the Don of Elland Road now. Sometimes, you catch sight of a headline and, as you feel your eyebrows heading for your hairline, you wonder to yourself: “Did I really read that right?” Such a headline caught my notice the other day. 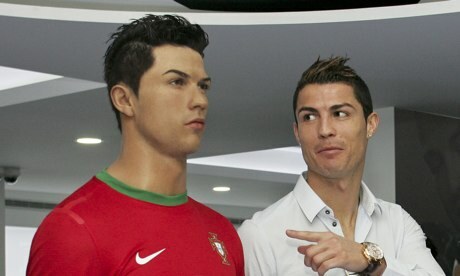 “Cristiano Ronaldo opens a museum in his own honour in Madeira, Portugal“, it read. My eyebrows still haven’t returned to their default position – if fact I may well have pulled a couple of muscles there. The thing is, the story in itself is not that surprising or earth-shattering. The impact is more of a jolt of self-affirmation – having a deep-rooted prejudice confirmed, right out of the blue like that. You just think – well, I was right about that lad. You see, I’ve long felt that Senhor Ronaldo has a touch of the Narcissus Complex about him. Many was the time when some noted Man U mouthpiece such as S’ralex Ferguson would say, with no evident sense of irony “Cristiano is the archetypal Man U player” or some such platitude. And I’d just nod, thinking to myself: isn’t he just. As was Royston Keane, pretend tough guy, for his blithe belief that the rules of the game were for lesser mortals. Cantona too, for his strutting, turned-up-collar arrogance – noticeably absent in his time at Leeds United where the likes of Strachan and Batty would have beaten it out of him. So, despite Ronaldo’s much-publicised yearning to head off for pastures Iberian, I was actually quite surprised when he left the Theatre of Hollow Myths a couple of years back. He just seemed like a perfect fit for that particular club, an apt representative of the puffed-up, self-regarding Pride of Devon. Since arriving in Madrid, a constant theme has been his desire to be regarded in the same light he regards himself – if such a thing were only possible. Because, alongside his undoubted brilliance as a player and his lavish habit of scoring goals at an unprecedented rate for a winger, there has always been this “look at me” air about him. This particular manifestation of narcissism is at its most apparent when he’s playing in a high-profile match, at the World Cup finals, for instance. There, the games are played in stadia equipped with those flying cams which zip about aerially, capturing close-ups of players from a position, seemingly, just above their heads. So whenever Ronaldo misses a goal or protests to the referee (he does this a lot), you’ll see him in a match like this, glancing at the nearest robot camera, then maybe checking out his magnified image on the inevitable big screen, admiring the pose even as he’s striking it. He has a special “poised to take a free kick” pose as well – you’ve probably noticed. He loves this one – legs akimbo, stock still, seemingly waiting for the crowd to subside to an awed hush. He sneaks little sidelong glances at the big screen then too, checking himself out. It’s really quite funny and a little bit pitiful. There’s no denying that he’s a very good-looking lad, and yet this too-evident, overpowering self-adoration is curiously unattractive, casting a patina of ugliness onto features usually apt to set hearts, not all of them female, a-flutter. It’s a character trait that makes it impossible to define Ronaldo simply in terms of his technical ability, his genius with a football at his feet, or even his extravagant goalscoring record. In this way, the narcissistic flaw in his make-up serves to keep him out of the Pantheon of True Greats, players – many of lesser ability – who combined admirable qualities such as humility, modesty, self-restraint on and off the field – things like that – with their obvious talent. Marks of maturity and character all, and reminders that talent alone, even genius, is not enough. Ronaldo’s flaws are less extreme than, say, Georgie Best‘s – and he’s certainly a much better pro – but just as was the case with Best, those flaws threaten to have him remembered at least as much for the negative parts of his persona as the positive aspects of his game. Ronaldo is simply unable to restrain this tendency to sound overtly, overweeningly in love with himself. As many know, when somebody is in love, they’re totally unable to comprehend how anyone would be able to resist loving the object of their adoration. It’s a type of tunnel vision – the lover cannot see anything but good about the loved. This would appear to be precisely the nature of Cristiano Ronaldo’s intensely passionate relationship with himself. If he ever needed a motto, he could do a lot worse than to open his Bible and paraphrase John 15:13, summing himself up with “Greater love hath no man than I for me”. By comparison, Narcissus himself comes over as having slight self-esteem issues. Ronaldo loves Ronaldo, and you get the feeling that he honestly can’t understand why the world at large can’t share in his joy. The opening of the CR7 Museum, by the adored CR7 himself, in honour of the said adored CR7, sums all of this up quite neatly. It provides independent verification of mine and others’ long-standing summing-up of Cristiano Ronaldo, and as such it’s really more to be wryly laughed at than fumed over. But it is a pity, in its way: a footballer’s life as an active player is, after all, relatively brief. After retirement, and as the glittering career fades ever further into the past, history can take a more jaundiced view of the former star than those who were there in the instant, cheering and applauding as a virtuoso performer plied his genius trade. The later view of the legend, the “warts and all” version, can even come to focus more on the warts than on much else worthy of admiration. If Ronaldo wants the eye of history to gaze benignly upon him (and you can bet your last penny he does), then a little humility, a little less obvious awareness of his own talent and gorgeousness would have been a big help. But it’s late in the day for that; even now he’s seen as someone in whom human virtues epitomised by the likes of John Charles or Bobby Moore are sadly absent. In the meantime though, why would Cristiano care? He is playing for one of the biggest clubs on the planet, he has won and will win many medals and trophies – his life is one grand, sweet song. It’s just that he appears to have been blighted by a crucial part of his development; that few years spent at Man U which can have an unfortunate effect upon an impressionable young man, especially one with a certain arrogance about him, the air of a braggart. It can have him believing in his own publicity and the rightness of everything he does or thinks, an impression reinforced by a complaisant media. Other, similar examples of this type have emerged from the club, other flawed characters who would have benefited from formative years spent in a less privileged and less insular environment. It manifests itself differently in Beckham, Keane, Cantona and a few more who spring to mind – but all of these players have emerged from Man U with character issues to confront, something they’re doing with varying degrees of determination and success. It does have to be said that not everyone is carried away on such a perilous tide; Paul Scholes for instance remained firmly detached from all the hype, to his eternal credit – and simply got on with his job. Andrei Kanchelskis was another such. Cristiano Ronaldo is simply the most obvious example of the kind of young man who in many ways summed up the character of a club like Man U, but in many more ways was in sore need of being taken down a peg or two when the time was still ripe for his character to develop along more attractive lines. The moral is, I suppose: If you have a talented youth who thinks he’s the bees’ knees – send him to Barnsley where he’ll learn the rudiments and have the more offensive edges knocked off him. You won’t produce quite such a polished player that way, it must be admitted. But you would end up with a much better all-round bloke; one who would perhaps guffaw derisively at the thought of opening a museum in his own honour. We all know what normally happens when any former footballer, once-famous manager or similar faded glory is asked the burning question: who was your greatest player of all time? The form is that you scratch your head to make it look as if you’re thinking, nod sagely and then say “Why, it was Georgie Best, of course”, before holding your hand out for the cheque and heading straight for a refreshing cappuccino – or for the nearest bar if you’re NOT Jimmy Greaves. Ex-Tottenham, Chelsea and AC Milan striker Greaves though – who also starred for Barnet FC and West Ham once his top-level playing days were done – had no doubts about his choice. John Charles, he explained, was not only one but two great players. At centre-forward just as much as when he was deployed in a defensive role at centre-half, King John had no peers. During his spell in Serie A with Juve, an environment Greaves knows well from his brief stint with the Rossoneri of Milan, John would often start a game up front and then, having scored the goal to gain his team a precious lead, would be pulled back to centre-half to ensure that they didn’t lose it. I’ve written a recent article myself about the great Charles, and how he should be regarded as the Best of British despite the populist claims of Georgie Best. I expected to find broad agreement among Leeds fans – certainly the ones who had been lucky enough to see John play whilst he was in his pomp – but I also expected that fans of other clubs would have been firmly aboard the Best bandwagon – particularly as this was a vehicle driven quite hard by George himself, who never had any qualms about expressing his view that he was the finest player of all time. With an ego like that, his spiritual home surely was the Theatre of Hollow Myths – but the fact remains that his professionalism and dedication were of a much lower order than is needed for true greatness to be accorded. That was very much my view anyway, and one that I hope can be seen as unbiased. But a little corroboration from among the ranks of ex-pros can’t do any harm. Interestingly, Greaves is not alone in dismissing the claims of Best. George’s team-mate at Man U, Denis Law, also felt that Best fell short of true greatness because of the flaws of character and discipline that accompanied his undoubted genius. By contrast, John Charles had an attitude and professionalism to match his incredible ability and the tremendous physique that enabled him to dominate two vastly different playing positions. Furthermore, in the highly defensive, cynical and violent Italian league, John was never booked or sent off – as indeed he never was throughout his career – a notable achievement for any player. 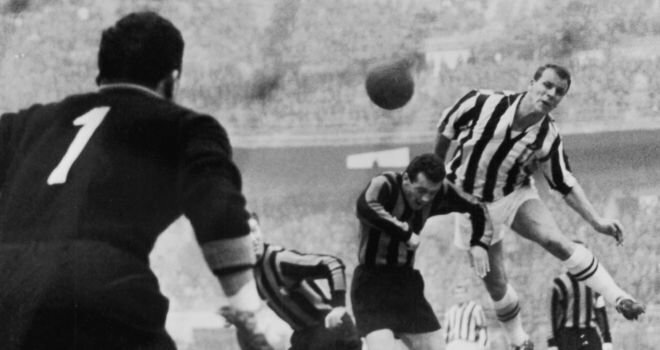 For a man often used as a defender in Serie A, it was little short of miraculous. John Charles was voted Italian football’s top “foreign import”, thus coming ahead of Platini, Maradona, Brady and even Luther Blissett. To this day, the fans of Juventus will greet a fellow football fan wearing Leeds United colours and talk eagerly of “il Gigante Buono”, the player that served both clubs so well, the man who has entered legend as King John. Jimmy Greaves – you were a top player, and you’ve proved yourself at last to be a man of judgement and discretion. I salute you.